Backyard Wrestling, 2014, basswood, birch plywood, milk paint, 22 x 18 x 20 in. 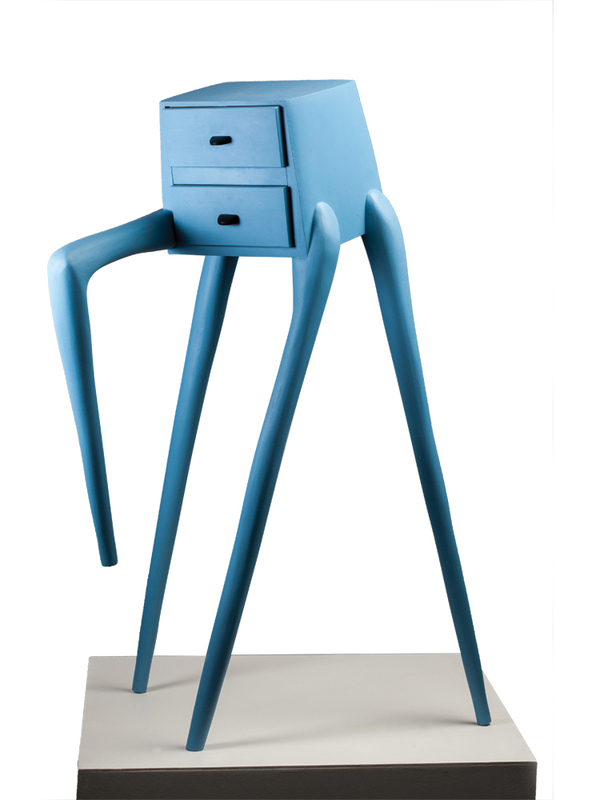 Colin Pezzano makes anthropomorphized furniture with long, gesturing limbs and other lifelike features. 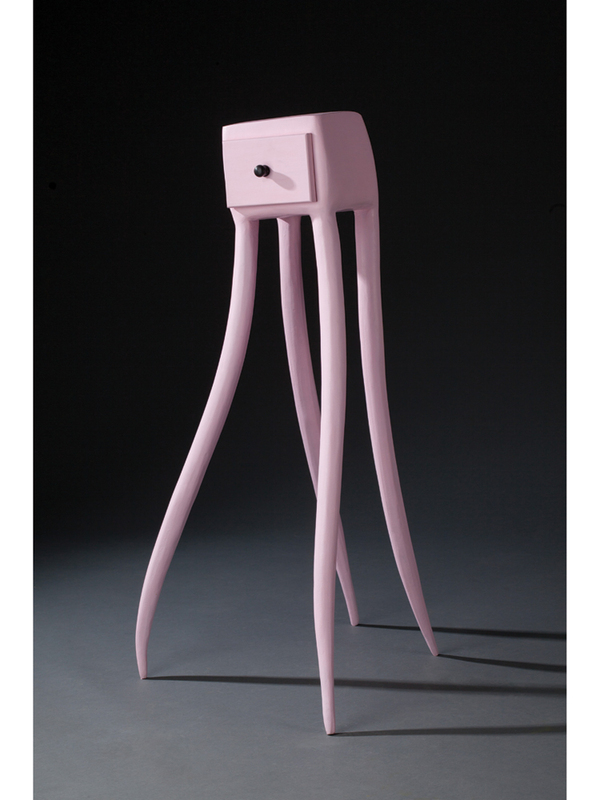 A tall, slender table in Pepto-Bismol pink has the loose, gangly legs of an octopus (or perhaps an awkward teenager), plus a name to suit its character: Phil.Pezzano has another tall, slender table he calls Stranger Danger. With four legs and an elevated front paw – the canine reference is unmistakable – Stranger Danger comes off as playful and fun. “I draw a lot from ’90s cartoons like Ren & Stimpy and comic books I really like by Daniel Clowes and Charles Burns,” Pezzano explains. Like a lot of Pezzano’s work, which relies on cartoonish colors and irreverent figures, Stranger Danger has a surprisingly sad back-story. Pezzano named the piece for the mannerisms of his dog, a reticent elderly Italian greyhound he left behind at his childhood home in South Jersey. “Really missing him comes out in the work,” he says. 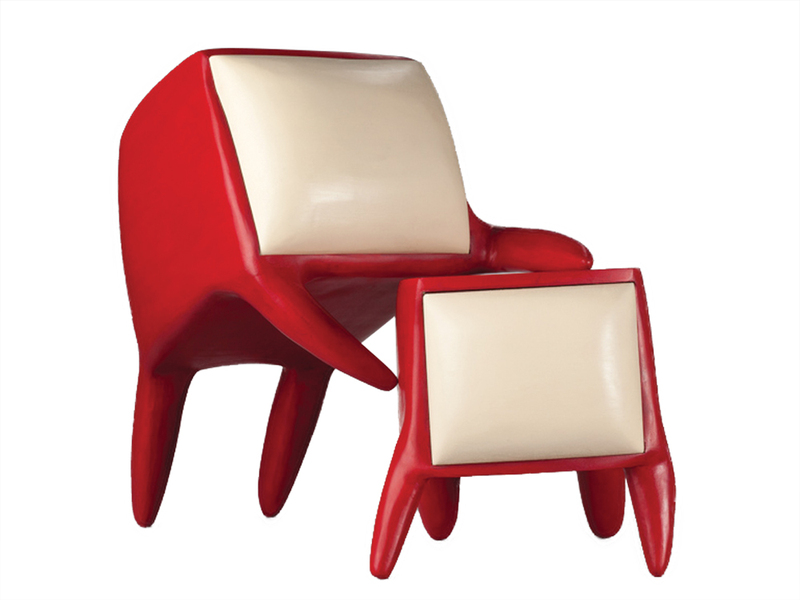 At age 22, Pezzano has already developed a distinct language within the furniture world. But just four years ago, he was an overwhelmed freshman at the University of the Arts in Philadelphia. Pezzano had planned to study industrial design, but he ended up hating all of his ID classes. “I just couldn’t do it,” he says with a groan. Remembering his boyhood dreams of carpentry, he made a bold and sudden switch. “I declared my major as a woodworker before I took any woodworking classes,” Pezzano says. Pezzano was thrust into a curriculum focused on basic woodworking skills. “It’s pretty technical,” explains Don Miller, head of the wood program at the University of the Arts and an advisor to Pezzano. Miller observed that Pezzano was uncomfortable with the early, more nitty-gritty aspects of his training, but the teacher watched Pezzano emerge with a strong vision during his junior year. “I had been trying to design all this earthy furniture,” Pezzano recounts. He finally decided to inject his interests (mainly characters from TV shows and surrealist comics) into his woodwork, adding plenty of narrative details along the way. “And that’s when I started being happy with my work,” he says. “Early on, I wondered if Colin shouldn’t be in sculpture,” confesses Miller, a nontraditional woodworker in his own right. But Miller came to admire how the functional aspects imbued Pezzano’s work with pathos. “The results are awkward, beautiful, and moving,” Miller says. He plans to linger on the Van Goghs (“I’m really into the color spectrum,” he says) and visit the Museum Vrolik, a collection of specimens of human and animal mutants. Then he’ll head back to the farm to craft more fantastical furniture for a show slated for a Philadelphia gallery sometime next year. 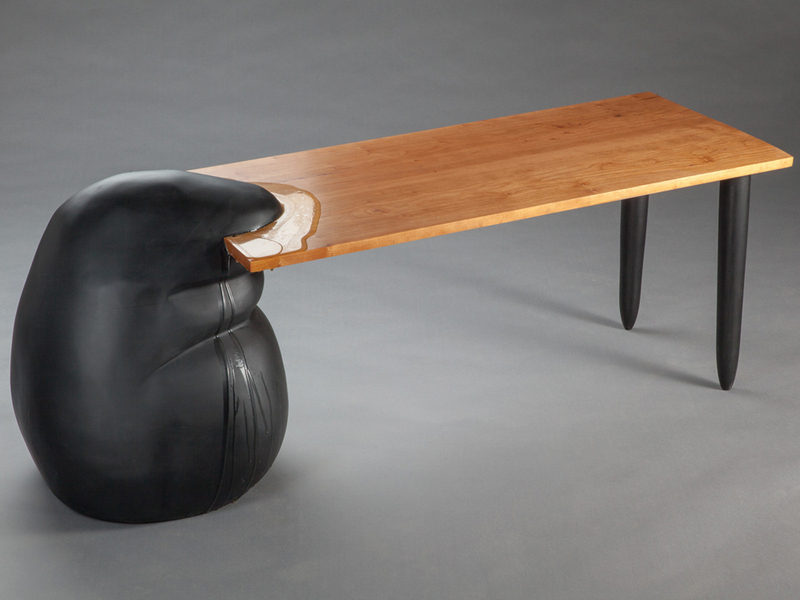 Blob Table, 2013, basswood, cherry, paint, epoxy, 27 x 54 x 18 in. 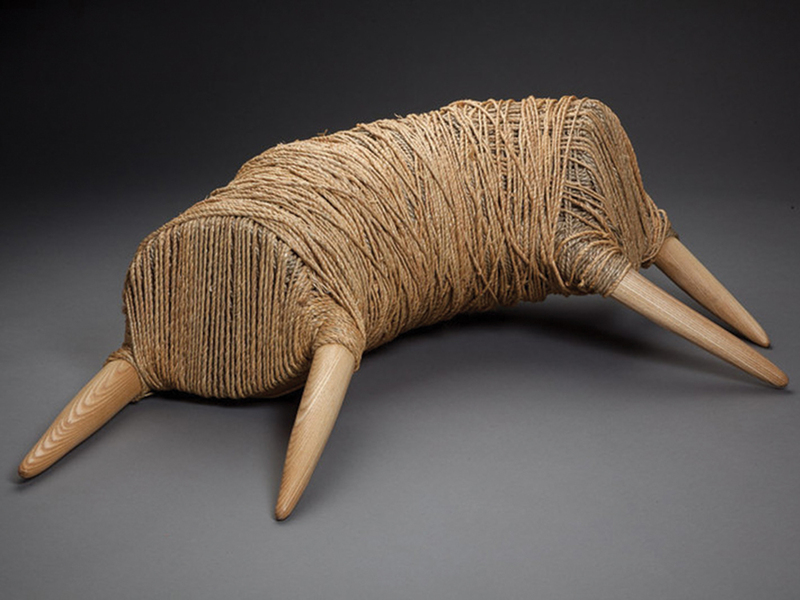 Gathering Dust, 2014, ash, birch plywood, sea-grass rush, 14 x 33 x 20 in. Stranger Danger, 2013, poplar, basswood,white oak, African blackwood, paint, 44 x 27 x 27 in. Phil, 2014, poplar, basswood, epoxy, paint, Robitussin, 39 x 20 x 18 in. 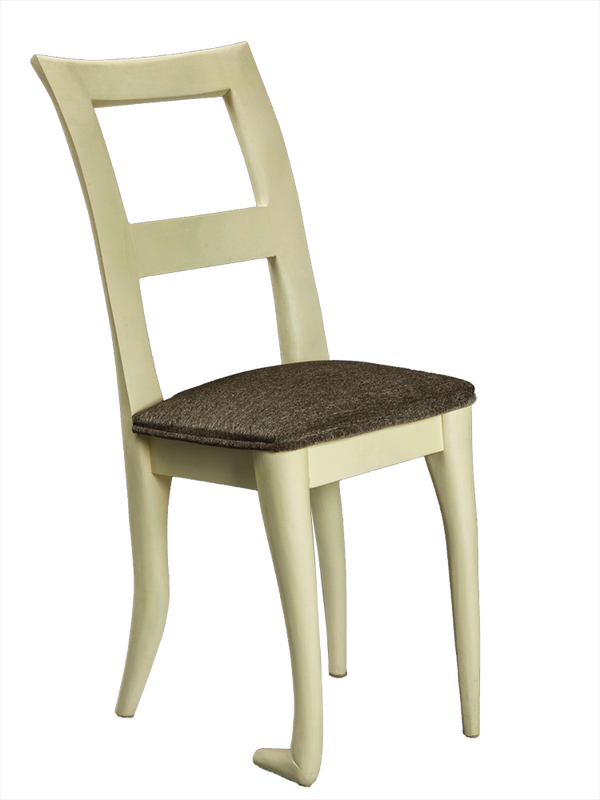 Chairrrrrrrrrr, 2013, poplar, fabric, paint, 38 x 28 x 27 in. 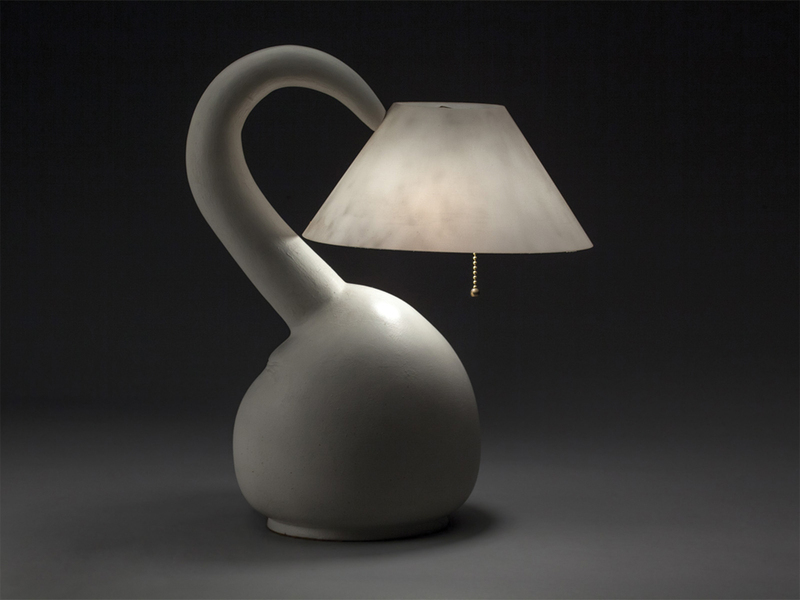 Lamp, 2012 basswood, milk paint, brass, found shade, 16 x 10 in. dia.